The Infinity Command Center Bi Level Console Table is a favorite of dispatch stations, 911 centers, and command centers requiring the simultaneous use of multiple monitors and keyboards. This "mother of all workstations" offers a curvilinear design that wraps the computer monitors around the user, addressing important human factors too often forgotten in the workplace. It is a "person-centered" design that offers a safe, comfortable workspace for any occupation that's computer intensive. Making frequent height adjustments as the day progresses is an important step in minimizing eye strain and repetitive stress injuries. With the push of a button, the Command Center adjusts to the appropriate task height in no time, from 27 to 39 inches in height. 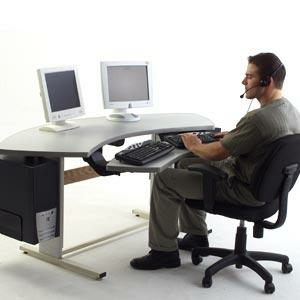 The ample tabletop easily raises and lowers as many as 4 large monitors-up to 450 pounds of equipment. The keyboarding surface can adjust independently to 7 inches above or 4 inches below the worksurface with a simple lift and lock motion. Optional CPU holders keep up to two CPUs accessible but out of the way. Grommets and wire management are integrated into the design to tame the clutter. Sturdy metal legs are graphite silver. UL Listed. Two Year Warranty.